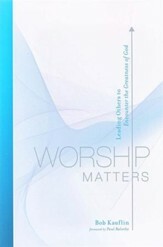 Very helpful book which teaches and informs regarding the purpose of worship and how we are to worship The Lord. Would recommend to others. This review was written for Worship Matters: Leading Others to Encounter the Greatness of God - eBook. This book taught me a lot of lessons about how I lead the worship team and as a worshipper. I am on the first chapters and enjoying and learning every bit of it. WOW!!!!! Every pastor, worship leader and Christian can benefit from this book. Insightful and most certainly a revelation of what true worship is all about...better said: Who true worship is all about. I would say the best book I have read on worship...5 stars is not enough! A must read for any worship leader. This is the third copy of Worship Matters I have purchased. It's so good I had to give some copies away. I believe every worship leader, worship team member, and Pastor should read this. I am re-reading it now! I've been in ministry for over 12 years and this book does a great job describing the role of a Worship Leader. I value the emphases right at the start on how important it is for the Worship Leader to have their heart in the right place before even attempting to lead others. The spiritual attention as well as the practical insight is very helpful. Will definitely return to the book often for follow-up study.